On Sunday, I noticed that my crocus and tulip bulbs are nudging their way out of the dirt. I love seeing this hopeful sign that the dark cold days of winter are drawing to a close. It is still too soon, however, to find the bright greens of spring — asparagus, peas, lettuces, arugula — anywhere local. Yet I find myself wanting to eat something green. I’m so tired of eating winter squash, root vegetables, and potatoes. I’ve been busy discovering winter greens — escarole, frisée, curly endive, watercress,  and other hearty greens that will grow in cool temperatures. Winter greens can really hit the spot during this transition time from late winter to spring. [%image "reference-image" float=left width=400 caption="Escarole."] Escarole looks like a head of Bibb lettuce that’s been flattened. The rough-edged pale green outer leaves become light yellow toward the center. I always cook escarole, because I think it is too tough to eat raw. My favorite way to prepare it is with caramelized onions. You’ll need a head of escarole, a medium-sized onion, a little olive oil, sugar, and a handful of currants. Slice the onion and cook it in a large skillet over low heat in a tablespoon of olive oil. You are not trying to fry the onions, so medium-to-low heat is essential. After the onions have softened (about 15 minutes), sprinkle with 1 teaspoon sugar and stir. Continue cooking the onions while you prepare the escarole. Rinse one head of escarole very well but don't dry it. Place the escarole on a cutting board and roughly chop it, discarding the core, into pieces about as big as your thumb. By now the onions should be light brown and caramelized. Add all of the escarole to the pan along with a handful of currants and cover. The water clinging to the escarole is just enough to steam it slightly. Cook for 7 to 10 minutes, stirring once or twice. Serve immediately. Frisée is a tumble of spiky leaves with notched edges, fading from dark green outer leaves to a butter-yellow center. Frisée has a slightly bitter flavor, and can be eaten either raw or cooked. To make a classic and versatile winter salad, pair frisée with blue cheese and toasted walnuts. You’ll need a large head of frisée (or a small head of frisée plus other tender greens), a lemon, a big handful of toasted walnuts, and a few tablespoons of walnut oil (another oil can be substituted, but the walnut oil really makes the salad great). Wash the greens, dry them, and add them to your salad bowl. Crumble some blue cheese into the bowl. Crush the walnuts gently with your palms and add them to the bowl. Add a couple glugs of walnut oil and a squeeze of lemon juice to the greens, then toss gently. Taste your greens to see if they need more dressing. This salad is great alone, but you can jazz it up too. Try adding sliced ripe pears or a poached Bosc pear. Pomegranate seeds are another colorful and tasty addition. It’s also great with slices of cooked flank steak; the sturdy frisée leaves can handle the warm steak without wilting. 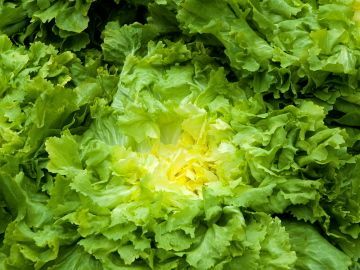 Curly endive has medium green sturdy leaves with frilled edges that curl on the ends. Curly endive is related to Belgian endive and chicory and, like them, has a slightly bitter crunch. Endive generally needs a very good washing to remove the grit and sand. My mom used to make what we called “wilted lettuce salad,” a combination of crispy bacon bits and endive tossed with lemon juices and hot bacon fat to wilt it slightly. I try to avoid bacon fat now, but I do like curly endive tossed with a little finely chopped bacon, dried cranberries, and the potent Spanish blue-veined cheese called Cabrales. A touch of balsamic vinegar and oil makes a light, flavorful dressing for this salad. Watercress is a tender, peppery green with heart-shaped leaves that I adore. My local natural-food store displays little clumps of watercress sitting in cups of water with the roots still attached. The delicate leaves should be rinsed gently and shaken dry. Discard the roots. The leaves can be added to a salad or tucked into a sandwich or pita. Watercress is also good steamed, cooked just as you would steam baby spinach. When I steam vegetables, I generally layer them according to how long they need to cook. The carrots, potatoes, or beets go in first, followed later by cabbage or cauliflower. I like to add a handful of watercress leaves over the other veggies and steam for about one minute. They have a great flavor and add that needed hit of green to my plate. Those tulip leaves that are peeking up a little more each day reassure me that winter will be over soon. Not soon enough for me, though! While I wait for the spring flavors of local asparagus and peas, I am enjoying a taste of winter’s green.